Kona coffee is the market name for coffee (Coffea arabica) cultivated on the slopes of Hualalai and Mauna Loa in the North and South Kona Districts of the Big Island of Hawaii. It is one of the most expensive coffees in the world. Only coffee from the Kona Districts can be described as "Kona". The weather of sunny mornings, cloud or rain in the afternoon, little wind, and mild nights combined with porous, mineral-rich volcanic soil create favorable coffee growing conditions. The loanword for coffee in the Hawaiian language is kope, pronounced [ˈkope]. The coffee plant was brought to the Kona district in 1828 by Samuel Reverend Ruggles from Brazilian cuttings. :9 English merchant Henry Nicholas Greenwell moved to the area and established Kona coffee as a recognized brand later in the 19th century. 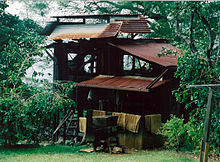 The former Greenwell Store and Kona Coffee Living History Farm have since become museums. In other parts of the Hawaiian islands, it was grown on large plantations, but the 1899 world coffee market crash caused plantation owners to lease land to their workers. :70 Most were from Japan, brought to work on sugarcane plantations. They worked their leased parcels of between 5 and 12 acres (49,000 m2) as family concerns, producing large, quality crops. The tradition of family farms continued throughout Kona. The Japanese-origin families have been joined by Filipinos, mainland Americans, and Europeans. There are approximately 800 Kona coffee farms, with an average size of less than 5 acres (20,000 m2). In 1997 the total Kona coffee area was 2,290 acres (9 km2) and green coffee production just over two million pounds. Kona coffee blooms in February and March. Small white flowers known as "Kona snow" cover the tree. Green berries appear in April. By late August, red fruit, called "cherry" because of resemblance to a cherry, start to ripen for picking. Each tree, hand-picked several times between August and January, provides around 15 pounds of cherry, which result in about two pounds of roasted coffee. Within 24 hours of picking, the cherry is run through a pulper. The beans are separated from the pulp and then placed overnight in a fermentation tank. The fermentation time is about 12 hours at low elevation or 24 at higher elevation. The beans are rinsed and spread to dry on a hoshidana or drying rack. Traditional hoshidanas have a rolling roof to cover the beans in rain. It takes seven to 14 days to dry beans to an optimal moisture level of between 10 and 13% (by Hawaii Department of Agriculture regulations: 9.0-12.0%). Too much moisture content in coffee allows the growth of ochratoxin A, a harmful mycotoxin, hazardous to human health. From here, the beans are stored as "pergamino" or parchment. The parchment is milled off the green bean prior to roasting or wholesale. Kona coffee beans are classified by law according to seed. Type I beans consist of two beans per cherry, flat on one side, oval on the other. Type II beans consist of one round bean per cherry, otherwise known as peaberries. Further grading of these two types of beans depends on size, moisture content, and purity of bean type. The grades of type I Kona coffee are 'Kona Extra Fancy', 'Kona Fancy', 'Kona Number 1', 'Kona Select', and 'Kona Prime'. The grades of type II Kona coffee are 'Peaberry Number 1' and 'Peaberry Prime'. Also, a lower grade of coffee, called 'Number 3' (or 'Triple X') can not legally be labeled as "Kona" but as 'Hawaiian' coffee. Any bean grade below Number 3 is considered 'Offgrade' coffee and can only be labeled as generic coffee. Not an official classification grade, but commonly used by Kona coffee farmers, is the 'Estate' grade where the various grades are not being separated from each other. Only the 'Number 3' and 'Offgrade' beans are being sorted out. Infestations of the root-knot nematode damaged many trees in the Kona districts in the 1990s. Symptoms are single or clusters of trees with stunted growth, especially when transplanted. In 2001 rootstock from the Coffea liberica species was found to be resistant to the nematodes. It could be grafted with Coffea arabica 'Guatemala' variety to produce a plant that naturally resists the pest, still producing a quality coffee product. The combination was named after Edward T. Fukunaga (1910–1984), who was superintendent of the University of Hawaii's Kona Research Station in Kainaliu in the 1950s through the 1970s. Because of the rarity and price of Kona coffee, some retailers sell "Kona Blends". These are not a combination of different Kona coffees, but a blend of Kona and Colombian, Brazilian, or other foreign coffees. Usually they contain only the minimum required 10% Kona coffee and 90% cheaper imported beans. Current Hawaiian law requires blends to state only the percentage of Kona coffee on the label but not any other coffee origins. There is no matching Federal law. Some retailers use terms such as 'Kona Roast' or 'Kona Style'. To be considered authentic Kona coffee, the state of Hawaii's labeling laws require the prominent display of the words "100% Kona Coffee". In 1993 the Kona Coffee Council, a regional coffee growers association, tried unsuccessfully to protect the name "Kona Coffee" by trademarking their logo with the United States Patent and Trademark Office. They were opposed by Kona Kai Farms, Inc, Captain Cook Coffee Co., Hawaiian Isles Enterprises, and Hawaii Coffee Company. In 2000 the Department of Agriculture of the State of Hawaii registered a "100% Kona Coffee" certification mark with the U.S. Patent and Trademark Office. Administration in regard to this certification mark was handed over by the State Department of Agriculture to the Hawaii Coffee Company, part of Topa Equities Ltd, based in Los Angeles. Kona coffee farmers launched a class action lawsuit against some of the largest retailers in the USA on Feb. 27, 2019. The Lanham Act permits a civil action for, among other reasons, “false designation of origin." Walmart, Costco, Amazon, Safeway, and Kroger are among the sellers and producers of 19 brands of supposedly Kona coffee that have been named in the complaint. In the 1990s, a company called Kona Kai Farms, in Berkeley, California, was sued on behalf of Kona coffee growers. In October 1996, federal officials in San Francisco indicted Kona Kai Farms executive Michael Norton on wire fraud and money laundering charges. He was found to have put Central American coffee into bags with labels indicating it was Kona coffee since 1993. In 2000 Michael Norton pleaded guilty to one count of wire fraud and one count of tax evasion. In 2007 his two sons were arrested in a multimillion-dollar medical marijuana scam. Some Kona farms have become successful tourist attractions. Although some roadside stands are allowed with special permits, large gift shops at some areas that are zoned agricultural have met local resistance. Former Mayor of Hawaii County Stephen Yamashiro, who served from 1992 to 2000, is credited with introducing the "100% Kona Coffee" logo and emblem now used by the industry. Coffee berry borer (Hypothenemus hampei), the most harmful beetle to the arabica coffee crop, was discovered in Kona coast plantations in September 2010 by a graduate student of the University of Hawaii. How the tiny beetle got to Kona is unknown, but the size of the infestation indicates it has been going for a few years. Some growers suspected severe drought conditions had reduced the fungus Beauveria bassiana, which might have kept the beetle population under control for years. By late November 2010, the Hawaii Department of Agriculture declared a quarantine on all green (unroasted) beans leaving the island. Fumigation with a chemical such as methyl bromide or a six-step procedure was required. The price of Kona coffee was expected to rise, up to a possible $50 per pound by December 2010, if the infestation lingers or spreads, because the insect has the potential to reduce crop yields up to 90%. In early 2011 the Hawaii State Dept. of Agriculture allowed the import and application of a concentrated naturally occurring fungus (beauveria bassiana) to successfully combat the infestation. ^ Mary Kawena Pukui and Samuel Hoyt Elbert (2003). "lookup of coffee". in Hawaiian Dictionary. Ulukau, the Hawaiian Electronic Library, University of Hawaii Press. Retrieved December 13, 2010. ^ a b Gerald Kinro (2003). A cup of aloha: the Kona coffee epic. University of Hawaii Press. p. 123. ISBN 978-0-8248-2678-9. ^ John C. Wright (January 19, 1974). "Greenwell Store nomination form". National Register of Historic Places. U.S. National Park Service. Retrieved December 13, 2010. ^ "Coffee Decline Caused by the Kona Coffee Root-Knot Nematode" (PDF). College of Tropical Agriculture and Human Resources of the University of Hawaii. March 1999. Retrieved 2009-11-06. ^ "Fukunaga, a Coffee Rootstock Resistant to the Kona Coffee Root-Knot Nematode" (PDF). College of Tropical Agriculture and Human Resources of the University of Hawaii. October 2001. Retrieved 2009-11-06. ^ "United States Patent and Trademark Office". United States Patent and Trademark Office. ^ Debra Barayuga (September 29, 1999). "Kona coffee farmers win fake-bean suit: Cheap coffee had been repackaged as expensive Kona beans for years". Honolulu Star-Bulletin. ^ "Berkeley Resident Pleads Guilty to Wire Fraud and TaxEvasion". Business wire press release. July 14, 2000. ^ Karin Stanton (April 30, 2007). "Neighbors' dispute could change Hawai'i ag tourism". Honolulu Advertiser. ^ "Former Mayor Stephen K. Yamashiro (1941-2011)". Hawaii 24/7. 2011-05-25. Retrieved 2011-07-10. ^ Michael Tsai (December 13, 2010). "Fungus holds clue to coffee blight". Honolulu Star-Advertiser. Retrieved December 13, 2010. ^ Erin Miller (November 25, 2010). "Kona coffee quarantined: Processors approve, farmers upset". West Hawaii Today. Retrieved December 8, 2010. ^ Ben Markus (December 7, 2010). "Destructive Bug Infests Hawaii's Kona Coffee Fields". National Public Radio. Retrieved December 8, 2010. Wikimedia Commons has media related to Kona coffee. Steiman, Shawn (2008). The Hawaiʻi Coffee Book. Honolulu: Watermark Publishing. ISBN 978-0-9815086-2-7. Bittenbender, H. C.; V. E. Smith (2004) . Growing Coffee in Hawaii. Honolulu: College of Tropical Agriculture and Human Resources, University of Hawaiʻi at Manoa. ISBN 1-929325-06-1. Goto, Baron (1982). "Ethnic Groups and the Coffee Industry in Hawaii". Hawaiian Journal of History. Honolulu: Hawaiian Historical Society. 16: 111–124. "Labeling Law for Hawaii-Grown Roasted and Instant Coffee". Quality Assurance - Commodities. Hawaiʻi Department of Agriculture. Retrieved 2009-09-26.